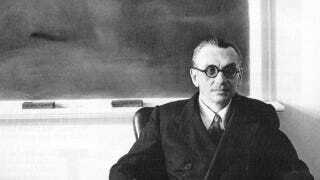 Kurt Gödel was best known as a mathematician and secondarily known as an extreme eccentric. After his death, he became known for something else: creating an ontological proof of the existence of God. While some branches of reasoning are meant to start with observable phenomena, ontological proof doesn't grow out of earthly proof. What heavenly thing could? Sure, things might look bleak on earth, but there could be other worlds where things always go swimmingly. Or perhaps in this world everything is going the only way they could possibly go, under the watchful eye of a loving God, but us humans are too blind to see that. Observation can't prove what is supposedly unprovable. Instead of detective work and evidence, ontological arguments are derived from reason alone. A set of assumptions, or axioms, are combined to prove a larger truth. Well this clears everything up, doesn't it? Gödel based his argument on an early argument of St. Anselm's. St. Anselm defined God as the greatest being in the universe. No greater being could be imagined. However, if God did not exist, then a greater being had to be possible to imagine - one which exists. Since it wasn't possible, by definition, to imagine a greater being than the greatest being imaginable, God had to exist. Gödel twisted this argument a little. He used modal logic to prove his point. Modal logic distinguishes between certain different states that certain suppositions have. Some suppositions are possible in some worlds, some possible only in a certain world, and some true in all possible worlds. If they are true in all possible worlds, they are considered to be always 'necessary'. God can either necessarily exist, or necessarily not exist. If God is an all-powerful being, and he exists, he necessarily exists in all possible worlds. If he doesn't exist, he necessarily doesn't exist in any possible worlds. It is not possible to say that God does not exist in any possible world. No matter how slim the chance is, God might exist. That means that God can't necessarily not exist. Since the choices are either God necessarily does exist, or necessarily doesn't, and we have eliminated the possibility that he necessarily doesn't, the only possibility left is that he necessarily does. Or maybe not. There's no doubt that Gödel was a brilliant man - he was a good friend of Albert Einstein's, who admired him greatly. It is also thought that, during his life, he had certain religious and mystical convictions. However, he specifically held the proof back during his lifetime because he didn't wish it to be taken as 'his proof that God exists'. He, in fact, didn't want people to think he believed in God at all. He was clear that the entire proof was simply an exercise in modal logic, derived from a certain set of assumptions. Those assumptions can be questioned. For example, Gödel's definition of God didn't have anything to do with the behavior of a deity, it was just a variation on St. Anselm's 'greatest imaginable being'. In other words, it was an axiom specifically chosen for both a vague sense of religion and the ability to make the rest of the proof work. If someone defined God differently - the being that made the world in seven days, for example - then the proof no longer applies. There have plenty of atheist thinkers knocking down the proof. And plenty of theist thinkers expanding on it. It's a pretty looking page, though. Via Stanford and Philosophy of Religion.